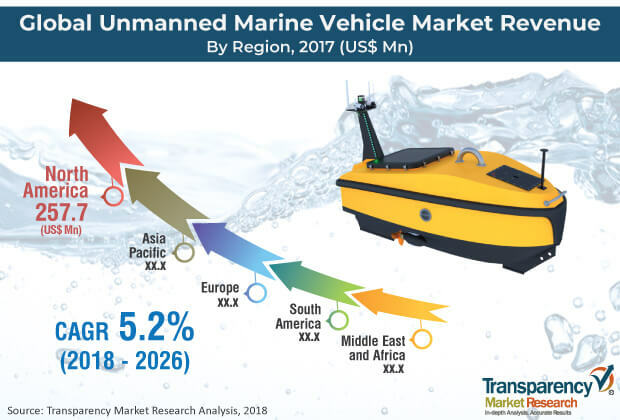 According to a new research report on the unmanned marine vehicle market, published by Transparency Market Research the global unmanned marine vehicle market is expected to reach value of US$ 1270.89 Mn by 2026, expanding at a CAGR of 5.2% from 2018 to 2026. According to the report, the market is likely to continue to be influenced by a range of macroeconomic and market-specific factors during the forecast period. In terms of demand, Europe is anticipated to be the leading market for unmanned marine vehicles, expanding at a CAGR of 5.6% between 2018 and 2026. This is primarily due to increasing demand for maritime security in coastal areas in Europe. The global unmanned marine vehicle market has witnessed strong growth over the last decade. The primary factor driving the market is rising threats in coastal areas across the globe. The defense sector is facing maritime security-related threats including anti-ship and anti-submarine missiles, seabed mines, and submarine warfare. These threats are forcing the defense sector to deploy unmanned marine systems i.e. either underwater or surface vehicles to counter these threats and minimize the human risk. Unmanned marine vehicles are capable to collect data from the ocean floor while keeping humans out of harm’s way. These vehicles are able to conduct survey of the ocean and perform different tasks such as ship hull inspection, mine hunting, scientific exploration, and data gathering. These features of unmanned marine vehicles are likely to drive the global unmanned marine vehicle market in the next few years. In addition, defense forces of the U.S., the U.K., France, Russia, and China are investing large amounts in research, development and engineering activities to develop unmanned surface vehicles (USVs) and unmanned underwater vehicles (UUVs) with the latest technologies, which is likely to propel the global market during the forecast period. The global unmanned marine vehicle market has been broadly segmented in terms of type, application, and region. Based on type, the market has been categorized into unmanned surface vehicle (USV) and unmanned underwater vehicle (UUV). The unmanned surface vehicle segment dominated the global market, holding 81.15% of the market share, in terms of revenue, in 2017. It is expected to expand at a significant CAGR of 5.3% during the forecast period. This is primarily attributable to growing utilization of unmanned surface vehicles in off-shore discoveries and surveys. In terms of application, the global unmanned marine vehicle market has been divided into oceanographic survey, hydrographic survey, environmental monitoring, marine security & defense, marine patrolling, offshore mining, and others. The marine security & defense segment dominated the global market, accounting for a leading i.e. 26.31% share of the market in 2017. The segment is expected to expand at a high CAGR of 5.6% from 2018 to 2026, due to rising concerns about maritime security. Among regions, North America is anticipated to hold the maximum share of the global market, while the market in Europe is likely to expand at the maximum CAGR during the forecast period. In 2017, North America accounted for 31.94% share of the global unmanned marine vehicle market. This is attributable to strong focus on the autonomy and intelligence of USVs and UUVs. Furthermore, the market in Europe is projected to expand at a significant CAGR of 5.6% between 2018 and 2026. This is primarily due to increasing demand from survey and scientific research industries in countries in Europe. The research study includes profiles of leading companies operating in the global unmanned marine vehicle market. Market players have been profiled in terms of attributes such as company overview, financial overview, business strategies, and recent developments. Some of the prominent players operating in the global unmanned marine vehicle market are BaltRobotics, Boeing, Deep Ocean Engineering, ECA GROUP, EvoLogics GmbH, General Dynamics Mission Systems, Inc., L3 ASV, Oceanalpha Co., Ltd., Subsea Tech, and Teledyne Marine. Companies are focusing on expanding their business through strategic acquisitions and partnerships.